Experience the science of heat with an international activation strategy. Thermal imaging cameras give you the power to see problems invisible to the naked eye, and to see in total darkness. It helps you detect, troubleshoot, and fix problems to prevent costly shutdowns and outages. As much as it's practical, it's also a lot of fun to work with. I was fortunate to collaborate with Type/Code to design and develop Flir photobooth. 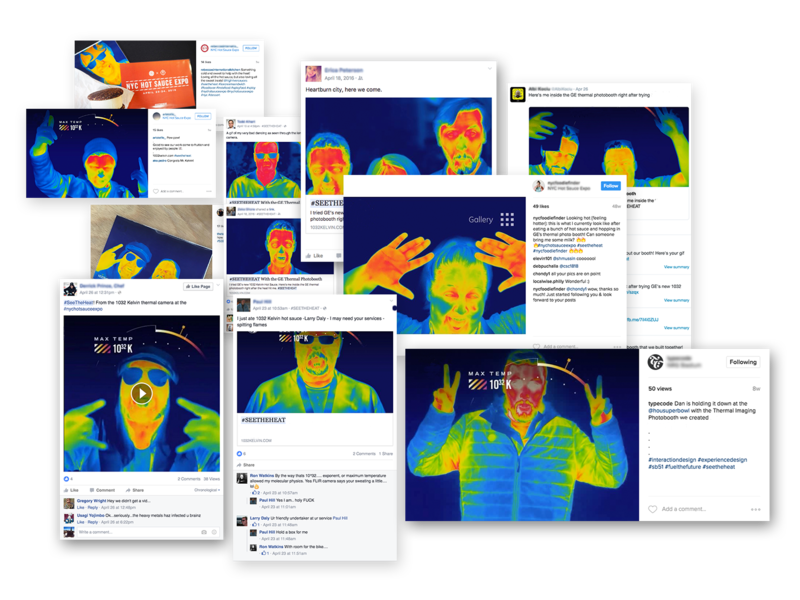 After roasting over a few ideas, we decided a thermal imaging powered GIF photobooth would be the best way to help people see and feel the science of heat. On the weekend of the Flir exhibit, participants could take photographs in front of our custom-branded thermal-imaging photobooth, then share their spicy moments over social media — all while immersed in environmental infographics that unpacked the science behind thermal imaging, promoting Flir brand and fostering customers loyalty. Photobooths are must-have attractions at events and festivals. Market saturation made it very hard to surprise the customers. Likely, when working with something as cool as thermal imaging cameras, the novelty of technology does the heavy lifting. Developing Therminator, we focused on streamlining the experience, making it approachable and enjoyable. The experience starts off with the simple activation of the screen, followed by a set of count-down animations. All the graphics were designed to evoke the memories of the Terminator (I'll be back!). After the gif is generated, we wanted the user to have a choice of how to receive the final photo. The user have the choice of printing a single shot or having a url with a download link to be sent to an email address. 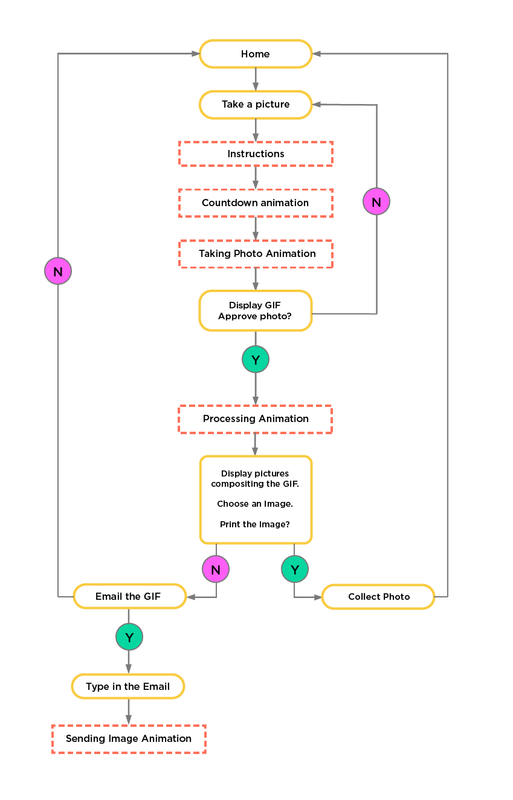 The diagram on the right demonstrates finalized user-flow that was used in the Therminator photobooth. Solid lines boxes represent user required action and the dashed line boxes are indications of animations. To provide support for the activation durating the expo, we developed a robust backend system that allowed the Thermal Imaging Photobooth software to be monitored and managed remotely. 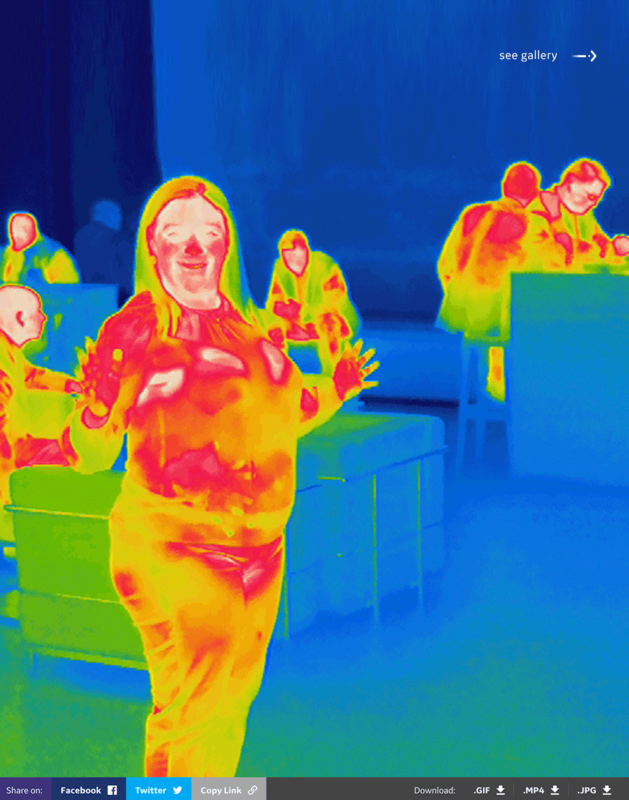 To host the streams of shareable images coming in from the event, unique microsite was served — providing a destination for participants to find their thermal imaging GIFs and learn more about Flir's industrial innovations. After thousands of in-person experiences, tens-of-thousands of media-coverage and social media impressions, the ‘Therminator’ activation campaign was a red-hot success, fulfilling its goal of engaging new audiences with Flir’s industrial innovations.